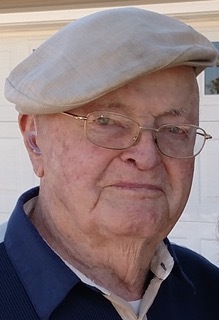 Doyle J. Fayhee passed away at Wesley Village, Macomb, April 11, 2019. He was born September 23, 1918, to John & Maurine (Clanin) Fayhee in Bernadotte, Illinois. Doyle graduated from Yates City High School. He was married to Gracie Sutton on November 16, 1940. She passed away on October 5, 2010. Doyle and Gracie had four children, Jack (Kathleen) Fayhee of Prairie City, Danny Fayhee, Judy Fayhee Gordon of Murfreesboro, TN and Jerry (Sandy) Fayhee. Doyle served in the United States Army from 1944 - 46 in both the Philippines and Korea. He was honorably discharged and returned to Prairie City to join his father and brothers in Fayhee Implement, later John Fayhee & Sons, a dealer and distributor of farm equipment throughout the Midwest They also imported farm equipment from Japan, Norway and Great Britain. Their business expansion necessitated the use of airplanes in order to better serve their customers and the brothers all became pilots and flew many thousands of miles in the next 50 years. As a natural progression they built Prairie City's first airport. Doyle enjoyed frequent dances and card playing with his wife Gracie. He was an avid card player where he made lifelong friends, a skillful bowler who maintained averages in the 200s into his late 90's. He also enjoyed many a challenging game of dominoes with his sister and family. On the occasion of his 100th birthday he celebrated with over 300 close friends and family and enjoyed dances with his 97 year old sister, Mary; his daughter, Judy and a couple nieces. In addition to his sons and wife, Doyle was preceded in death by brothers Donald and Paul and sister Eloise Coultas. Doyle is survived by sister, Mary Fayhee Askins; son, Jack (Kathleen) of Prairie City and daughter, Judy Gordon of Murfreesboro, TN. Also surviving are grandchildren: Marlene (Jim) Bruner, Rod (Julie) Gordon, Dr. Mary Kathleen Lockhard (David) Miller, John Fayhee, Brad Fayhee, Scott Fayhee, Chris (Ashley)Fayhee, and Julieann Fayhee and 14 great-grandchildren along with many loving nephews and nieces. Doyle's life and love of life was expansive and enriched the lives of his family and friends. His quick wit and warm smile will be missed but we are all very grateful for the many years we had with him. Funeral services will be at the Wise Funeral Home in Avon, Illinois on Sunday, April 14, 2019, with visitation with the family from 1:30 to 2:30 pm followed by a service at 3:00 P.M. also at the funeral home. Graveside services will be immediately after at the Prairie City Cemetery, Prairie City, Illinois. Memorials may be made to St. Bernards Catholic Church, Bushnell VFW, and or Wesley Village. Online condolences may be made at www.wisefamilyfuneralhome.com . Wise Family Funeral Home in Avon is in charge of arrangements.